1 of 2 Stir together tomatoes, eggplant, zucchini, celery, onion, tomato puree, vinegar, sugar, parsley and basil in a slow cooker. Cover and cook on HIGH for 4 hours or LOW for 6 hours. 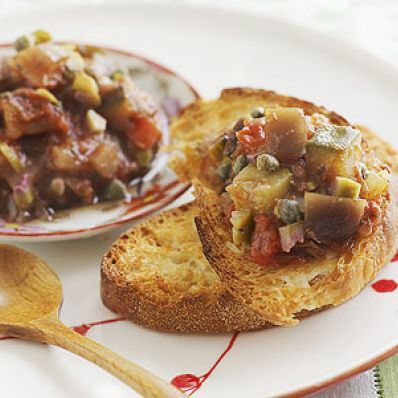 2 of 2 Stir in olives and capers. Serve warm, at room temperature, or chill overnight. Spoon about 1/4 cup onto each toasted bread slice. Per Serving: 0 mg chol., 151 mg sodium, 0 g sat. fat, 1 g fiber, 2 g pro., 46 kcal cal., 1 g Fat, total, 9 g carb.